The policy framework, policy metrics (Policy and Institutional Indicators), and performance metrics (National KPI Dashboard and related Inclusive Development Index) presented above are intended to provide countries with tools that can help turn the goal of inclusive growth into a practical and measurable plan of action. To be certain, these metrics have their own limitations, and the decision about which elements are more important than others is left to the user insofar as the tables presented above weight each indicator equivalently. But while they do not purport to tell everything about national economic performance, they do provide a more integrated and complete picture than the conventional metric of GDP per capita, particularly if the overriding objective is the one stated so often by so many stakeholders in recent years: achieving a more socially-inclusive model of economic growth and development. In addition, the interactive version of the Index presented at wef.ch/igd17 enables the user to vary the weighting of the indicators in the Index to emphasize the elements they think are most important for their country’s circumstances. See Table 8 (in Part 2) for one such scenario. Several important implications for national policymaking and international economic cooperation flow from this policy framework and benchmarking data. Action on them by major economies would offer a path for the world economy out of its current predicament of slowing growth, rising in-country inequality, and eroding public support for international integration. Reconceptualize domestic structural reform as an ongoing systemic process encompassing a multidisciplinary set of demand- and supply-side factors that together support the diffusion of economic opportunity and national income, thereby deepening the foundations and broadening the base of growth itself. Place as much emphasis on the construction of this wider structural policy and institutional ecosystem as they traditionally do on macroeconomic, finance and trade supervision policies, which influence mainly the efficiency and level of economic activity. Rebalancing policy priorities in this manner would imply a profound change for many countries and indeed for the “growth model” that has been posited for a generation by much of the economic policy establishment, including key international organizations. The wider ecosystem of structural policies and institutional capacities described in this Report underpins the capacity of modern market economies to diffuse the gains from growing national income throughout society in the form of broad-based progress in living standards. It is the “income-distribution system” of a modern market economy writ large. Its robustness as a whole determines how effective government is in shaping the inclusivity of growth. Fiscal transfers and tertiary education are important, but they are just two of a much larger set of relevant policy levers. This ecosystem has deteriorated or has been inert in many advanced countries over the past two decades as the forces propelling secular dispersion – technological change, global integration, domestic deregulation, and increased immigration – have intensified. For their part, many developing countries have lagged in constructing its basic elements as they have begun to industrialize and integrate into the global economy, missing an opportunity to include more of their populations in the growth process and its benefits, in addition to rendering their economies more vulnerable to fluctuations in exports and commodity prices. Efficient markets and macroeconomic stability are essential to economic growth. But how well growth benefits society as a whole depends on the framework of rules, incentives, and institutional capacities that shape the quality and equity of human capital formation; the level and patience of real economy investment; the pace and breadth of innovation; the effectiveness and flexibility of worker protections; the coverage and adequacy of social insurance systems; the quality and breadth of access to infrastructure and basic services; the probity of business and political ethics; and the breadth and depth of household asset building. This recognition and the resulting rebalancing of policy priorities is what is required for governments to respond more effectively to decelerating growth and rising inequality – to take seriously the social frustrations increasingly being expressed through the ballot box and on the street. These frustrations have an essential validity. The implicit income distribution system of many countries is in fact severely underperforming or relatively underdeveloped, but this is due to a lack of attention rather than an iron law of capitalism. Inequality is largely an endogenous rather than exogenous challenge for policymakers and needs to be recognized and prioritized as such in order to sustain public confidence in the capacity of technological progress and international economic integration to support rising living standards for all. For many countries, a reimagined process of structural reform aimed at broadening the base and benefits of growth may also be the best hope for accelerating its rate in the current context. For example, in advanced countries experiencing diminishing returns from extraordinary monetary policy measures, limited fiscal space, and unfavorable demographic trends (e.g., Japan, USA, and the EU, to different degrees), a mixture of demand- and supply-side structural reforms could boost consumption and job creation in the short term while raising the economy’s longer term growth potential through lasting improvements in labor productivity, household finances, real economy investment, and innovation. In middle-income countries experiencing weak exports and commodity prices, monetary policy constrained by the risk of currency depreciation and capital flight, and limited fiscal space (e.g., most of the BRICS), a structural reform agenda of this nature is precisely what could rebalance their growth model toward more robust domestic consumption. Similarly, for lower-income countries with extensive social marginalization – due to poor resourcing of, and inequitable access to, basic services, education, and infrastructure, as well as weak legal, tax, and investment climate institutions – a reform strategy with a sharper focus on these basic building blocks could help boost growth and social equity simultaneously. In sum, strengthening the policy and institutional ecosystem supporting inclusive growth deserves to be a top policy priority for countries, whether they are experiencing slow growth, elevated inequality, or both. This is an imperative for countries seeking to thrive in the Fourth Industrial Revolution. The debate about how countries can preempt the further job losses and concentration of wealth that may otherwise accompany the proliferation of robots, artificial intelligence, and other technologies has quickly gravitated to the idea of a universal basic income. Some version of a universal basic income may form part of an appropriate policy response. But it is unlikely to be effective or feasible by itself, whether due to the fiscal burden it may create or the aspects of social inclusion it may not fully address, such as the sense of dignity and fulfillment that comes from being part of the growth process by having a good job or the opportunity to start a business. Here again, a systemic rather than silver-bullet approach is likely to be most effective. Specifically, five dimensions of workforce development and security merit particular attention in industrial countries seeking to keep pace with the labor market challenges accompanying the Fourth Industrial Revolution. Policy and Institutional Indicator (PII) data suggest that few countries, if any, are performing well across all five. Active labor-market policies: As the pace of change accelerates in the economy, the enabling environment for worker adjustment and training becomes more vital. The Policy and Institutional Indicator (PII) data suggest that some countries such as Denmark, Sweden, and Finland have kept pace thus far. Others, notably the US, Israel, and Japan, are lagging substantially behind. For example, the US invests only 0.11% of GDP in active labor-market policies (training and job search assistance) compared with an OECD average of 0.6% and levels of 1% or more among top performers. A gap such as this predisposes countries to skills mismatches, long-term under- and unemployment, eroding labor force participation rates, and persistent geographical pockets of social exclusion, that is to say lower economic growth and social inclusion. Equity of access to quality basic education: Inequitable educational opportunity is another source of avoidable under- and unemployment and suppressed human and economic potential. The policy indicator data reveal large variations in country performance, suggesting that some countries can learn a considerable amount from the practices of others. Across several measures of the impact of socioeconomic status on educational performance,Luxembourg, France, Belgium, Czech Republic, Israel, Slovak Republic, Sweden, Austria, and Greece exhibit the greatest weakness, with Japan, Estonia, Finland, and Canada leading the way. Laggards in this area risk locking-in higher levels of inequality and social exclusion across generations. Gender parity: It is generally recognized that redressing major disparities in the participation of women in the workforce can be one of the most effective ways to raise rates of economic growth and progress in broad living standards. East Asian economies have particular room for improvement in this area, with Japan and Korea having among the widest gender gap in labor participation within the OECD (i.e., female rates of less than 80% of men). However, other countries such as Italy, Greece, Singapore, Ireland, and the Czech Republic would also benefit from greater initiative in this area. Gender gaps in income are even more pronounced – with female workers earning an estimated 60% or less of the level earned by men – in the United Kingdom, Korea, Netherlands, Japan, Italy, Austria, Greece, Ireland, Israel, and the Slovak Republic. Rates in top-performing countries, by contrast, are 80% or more. Non-standard work benefits and protections: Almost half of the jobs created between 1995 and 2007 in OECD countries were temporary, part-time, or involved self-employment. 55 As sharing, on-demand, and care-economy jobs expand along with the digital economy and employers seek to remain as flexible as possible in the global market, this part of the labor sector is likely to expand further. Because self-employed, temporary, and/or part-time workers tend to experience weaker statutory benefits and protections in many countries, there is a risk that inequality will expand as a result of the changing nature of work. Most such rules were crafted in an earlier era, and updating them should be a priority in the Fourth Industrial Revolution. 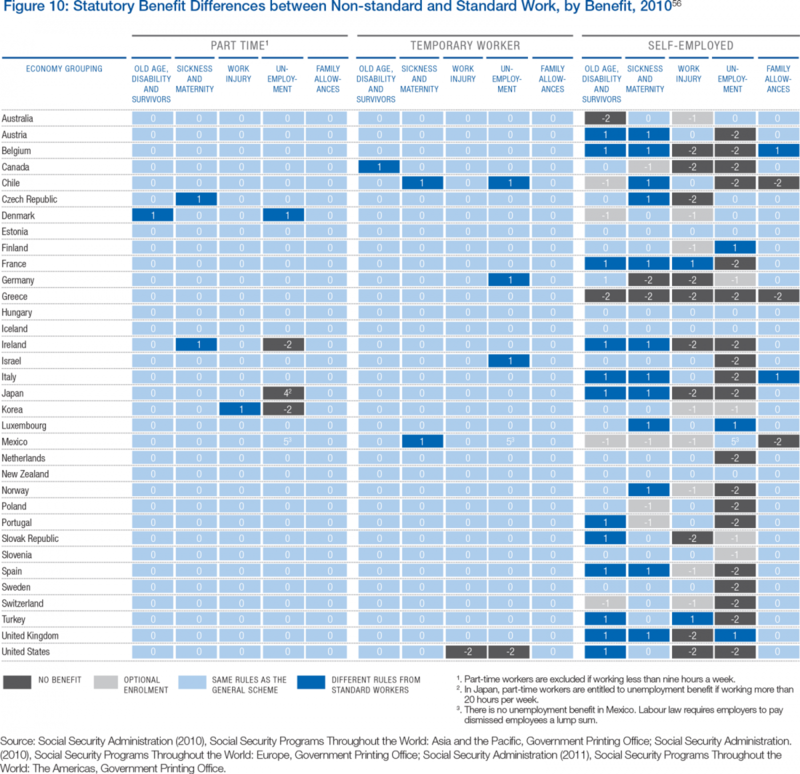 Figure 10 illustrates the gaps and variability in rules across OECD countries. School-to-work transition: Many advanced economies have made great progress in raising the proportion of student population that goes on to attain a tertiary education degree. Others still have a considerable way to go in making university education broadly accessible, with Canada, Switzerland, the United Kingdom, and Slovak Republic having enrollment rates below 60%, compared with 80% or above in the top-12 OECD countries. At the same time, some advanced countries appear to be significantly underinvesting in technical, software, and skilled trades. In six countries – Canada, Singapore, Republic of Korea, Japan, Ireland, and reportedly the US (for which official data are incomplete) – fewer than a third of secondary students enroll in vocational programs. A universal basic income is no substitute for these five crucial institutional underpinnings of a well-functioning labor market. It may serve as a useful complement at some point, but countries seeking to prepare their workforces for the Fourth Industrial Revolution would do well to invest in the strength of this ecosystem as a whole. Countries lagging in a majority of these domains should set a discrete national target and public-private implementation strategy for increasing investment in their people across these areas. Increased infrastructure investment has also emerged as an important policy option for responding to slow growth and rising inequality. But this, too, is not a panacea. Countries at various stages of development have chronically underinvested in infrastructure. In advanced countries, particularly, the principal rationale being offered to reverse this trend is a macroeconomic one: to provide a relatively short-term stimulus to employment creation and aggregate demand. While this could indeed be a helpful and appropriate contribution of increased infrastructure investment in some countries – particularly as part of a strategy to provide central banks with additional policy space to normalize interest rates – it should generally be a secondary rationale. A well-structured and sustained program of infrastructure investment is fundamentally about raising the growth potential and quality of life within an economy. It boosts economic efficiency, reduces deadweight losses in productivity, and improves human well-being over time. It can also create macroeconomic benefits or risks in the short term depending on prevailing economic conditions. But first and foremost, infrastructure investment should be considered a structural element of a strategy to generate sustained improvements in economic efficiency and broad living standards over time, rather than merely a tactic to stimulate the economy and boost output in the near term. Canada’s commitment to inclusive growth and its ambitious plan to revitalize its economy, foster long-term growth, and strengthen the middle class now provides a model for the international community.7-2 Central to this plan is Canada’s continued commitment to diversity, immigration, and global investment. Canada’s approach to inclusive and sustainable growth recognizes that there are no quick and easy solutions to fostering durable and broadly-shared growth. That is why the Government of Canada is using a broad set of policy levers. It began by taking steps to create fairer income distribution through provision of direct income support. Benefits for low- and middle-income families with children were increased, which is expected to reduce the number of children living in poverty by roughly 40%. Income taxes have also been reduced for nearly nine million middle-class Canadians. Further, the government has taken steps to reinvigorate growth, starting with increased investment in public infrastructure; redoubling of efforts to attract foreign capital through the establishment of a new agency, the Invest in Canada Hub; and changes to Canada’s immigration system to provide faster access to top talent globally. New investments in infrastructure totaling $95 billion will boost economic growth and social inclusion by reducing traffic congestion and commute times, and by providing more affordable housing. A new institution, the Canada Infrastructure Bank, will be set up to focus on attracting private capital to spur innovative funding and financing for infrastructure projects. This bank will work with governments and investors to provide better results for middle-class Canadians by identifying potential projects and investment opportunities that contribute to larger economic, social, and environmental returns. The government is also taking steps to ensure that Canadians have the tools they need to succeed in the modern economy. New measures have been enacted to make post-secondary education more affordable, the employment insurance system more inclusive, and the retirement income system more secure. In addition, recognizing that transitioning to a green economy will be essential to sustained economic growth, the government is investing $5 billion over the next five years in green infrastructure and in providing incentives for families and firms to reduce emissions. In partnership with subnational governments, the federal government will implement carbon pricing and establish meaningful environmental targets for green infrastructure projects. These changes will lead to reduced energy consumption and improved water quality in Canada’s lakes and rivers. Ultimately, there will be better outcomes for communities facing threats from climate change. The Government of Canada has also introduced important measures to advance gender equality. Budget 2016 included new investments in Status of Women Canada – a government agency that promotes equality for women and their full participation in the economic, social and democratic life of the country7-3 – to enhance its capacity to provide government-wide support on the gender-based analysis of programs, policies, and legislation. On the economic front, a new “Canada Child Benefit” was introduced to provide families with more support for raising children, directly assisting women’s labor market attachment and their long-term economic security. The Government of Canada also increased the “Guaranteed Income Supplement” top-up benefits in order to lift low-income single seniors, many of whom are women, out of poverty. On the international stage, Canada is committed to strengthening its place in the world, and recognizes the importance of international assistance. The ongoing review of Canada’s international assistance will help to refocus policy and programming on supporting fragile states and helping the poorest and the most vulnerable – focusing particularly on women and girls. In this effort, Canada will also encourage multilateral institutions to place gender equality at the core of their work. Canada is also changing the way it looks at the performance of its economy by adopting a new lens that measures progress differently by placing greater weight on broad-based gains rather than strict economic measurements that might miss the bigger picture. This new perspective combines metrics like job creation with equally important outcomes like quality of life, job satisfaction, poverty reduction, and access to opportunities. This is being put into practice through a new emphasis on data and measurement. This approach, termed the “results and delivery” approach, was inspired by the UK model of “Deliverology.” Developing and monitoring an appropriate set of indicators is a key component of this approach. Building from Canada’s participation in the working group that developed and refined the indicators in this Report, the results and delivery approach will help Canada with its own efforts to track progress on inclusive growth. Canada recognizes that to be at the forefront of the changes in the global economy, the public and private sectors must work together to help create conditions for success. In March 2016, Canada’s Minister of Finance announced the creation of the Advisory Council on Economic Growth to focus on policy actions that generate strong and sustained long-term economic growth that is shared across income groups. The Council has used the World Economic Forum’s Framework for Inclusive Growth to evaluate the implications of its recommendations for inclusiveness. Informed by advice and recommendations from the Council, Canada will continue to develop its long-term plan to boost growth in the face of challenges like those posed by an aging population. Reconceptualizing domestic structural reform as an ongoing systemic process encompassing a wider range of demand- and supply-side factors that influence the pattern of growth and the diffusion of its benefits – and according such a continual process of institutional deepening as much weight as macroeconomic, financial supervision and trade policy – would imply a profound change in the “growth model” that has shaped the thinking of much of the economic-policy establishment for an entire generation, including in key international organizations. This reimagining of structural economic policy holds the key to translating inclusive growth from global aspiration into global action. How could international cooperation help individual countries and the world economy as a whole move in this direction? First, major economies could undertake a coordinated effort to boost global growth by identifying and implementing the structural reforms that are most needed to activate the virtuous circle of inclusive growth in their economies. Governments could use the Framework and the metrics presented here as a starting point for an examination of whether their structural policy enabling environment for inclusive growth has been optimized, i.e., whether, on the basis of the experience and practices of their peers, they have unutilized policy space in one or more of the 15 sub-domains. They could then draw upon the structural policy analyses of other international economic organizations, particularly the OECD which has a wealth of deep analysis and prescription in these domains, as well as the World Bank, ILO, and others, to develop an action agenda tailored to their circumstances. The World Economic Forum and these organizations could provide further support by organizing public-private, interdisciplinary input into and support for the agendas that emerge. Such a global effort in 2017 to reinvigorate global growth by broadening its base and strengthening its long-term foundations – making it less dependent on short-term macroeconomic measures and export demand – is precisely what the world economy needs to combat the cyclical and secular pressures weighing on growth. The process undertaken by the Canadian government, as described in Box 7, to develop a new inclusive-growth strategy provides a constructive example for other countries. The G20 Enhanced Structural Reform Agenda, launched during China’s recent presidency, provides an opening for such a coordinated international initiative. G20 Finance Ministers and Central Bank Governors “committed to further enhancing the structural reform agenda, including by developing a set of priorities and guiding principles as a reference for G20 reform efforts, as well as by creating an indicator system to further improve assessing and monitoring of the progress of structural reforms and their adequacy to address structural challenges, taking into account the diversity of country circumstances.” This process, which lists inclusive growth as the last of nine focus areas, could be sharpened and infused with a sense of urgency by leaders during the German G20 presidency. Second, international organizations and their major shareholder governments should spearhead a movement to increase the social inclusivity of growth around the world by embracing this reformulation and reprioritization of structural economic policy in their public signaling, country advice, and development cooperation programs. They could jointly and explicitly state that broad-based progress in living standards is the ultimate measure of national economic performance (as opposed to expansion of national output, per se) and that the structural and institutional factors which shape pre- and post-transfer levels of social inclusion are as important as the traditional focus of chief economic advisers and finance ministers on macroeconomic, financial, and trade policy. The drivers of economic efficiency described by the so-called Washington Consensus remain important, but they represent an incomplete and therefore unbalanced agenda. Cultivation of the structural policy ecosystem that underpins the diffusion of living standards within a modern market economy requires parallel and equal attention. This rebalancing of the growth and development process is part of the unfinished business of recovery from the financial crisis as well as an important lesson to be drawn from the social backlash against globalization in some countries. By virtue of their public profile and intimate relationship with the economic ministries of governments, the major international economic organizations have a vital role to play in the establishment and scaled application of this new and more inclusive growth model. See Box 8 with a perspective from the International Monetary Fund. Increase the absolute amount and relative share of development assistance devoted to helping countries implement demand- and supply-side structural and institutional improvements that broaden social participation in the process and benefits of growth. Shift the emphasis of development finance institutions from direct lending to catalyzing much larger amounts of blended, public-private financing for development, particularly for sustainable infrastructure. Reset the priorities of international trade and investment cooperation. Economists tend to be advocates of globalization. The benefits of specialization and exchange are evident within a country’s borders; no one would seriously suggest that impeding the flows of goods, labor, and capital within a country would raise national welfare. Globalization extends the possibilities of specialization beyond national boundaries. Recent work suggests, however, that while globalization is great in theory, vigilance is needed about it in practice. The three main components of globalization – goods, labor, and capital – are associated with different costs and benefits. The preponderance of the evidence suggests that trade has positive impacts on aggregate incomes, but many people do lose out. The economic benefits of migration are very high, but it also has distributional consequences and impacts on social cohesion. The case for globalization is weakest when it comes to financial globalization – the free flow of capital across national boundaries. It has not yielded efficiency benefits as expected, but has been associated with increased inequality. Financial globalization also interacts with other policies, in particular domestic fiscal policy, which has distributional effects. Aggregate and Distributional Effects of Financial Globalization: Capital account liberalization can allow the international capital market to channel world savings to their most productive uses across the globe. Developing countries with little capital can borrow to finance investment and promote economic growth without requiring sharp increases in their own savings. But equally, there is little doubt about the existence of genuine hazards of openness to foreign financial flows. The link between financial globalization and economic growth is complex.8-1 While some capital flows such as foreign direct investment boost long-run growth, the impact of other flows is weaker and critically dependent on a country’s other institutions as well as on how openness is sequenced relative to other policy changes. Financial globalization also interacts with other policies, notably fiscal policy. The desire to attract foreign capital can trigger a race to the bottom in effective corporate tax rates, lowering governments’ ability to provide essential public goods. Fiscal consolidation has been shown to increase inequality. Beyond this, in the short run, the extent of redistribution could be increased. This can be done through some combination of higher tax rates (greater progressivity in income taxes and increased reliance on wealth and property taxes, for instance) and programs to help those who lose out from globalization. In the case of trade, programs of adjustment assistance do exist. That they have not always worked well in the past is an argument for fixing, not discarding, them. In the case of migration, too, compensation to potential losers could be expanded by targeting areas that witness more entry of foreign workers. This can be done by providing generous unemployment insurance benefits and allocating more resources to active labor-market policies aimed at matching displaced workers with jobs. In the longer run, the solutions lie not in redistribution but in mechanisms that achieve “pre-distribution.” More equal access to health, education, and financial services ensures that market incomes are not simply a function of peoples’ starting point in life. This does not ensure that everyone will end up at the same point. But the provision of opportunities to do well in life regardless of initial income level, combined with the promise of redistribution for those who fall behind, is more likely to build support for globalization than will simply ignoring the discontent with it. Increasing development assistance to support economic institution building: As indicated above, the path to a more inclusive and resilient growth model begins with a deeper appreciation of the important role that legal frameworks and institutional enforcement capacities play in the development process in such areas as tax administration; competition; investment; anti-corruption: judiciary; labor; environment; social protection; and business-government relations. This is an important, if somewhat neglected, lesson of the Western and East Asian industrial development experience, judging by the low absolute and relative amount of development assistance dedicated to this purpose. The policy advice given by the international financial institutions (IFIs) should reprioritize institution-building in these areas of structural economic policy, while bilateral donors and multilateral development banks should significantly increase (perhaps double or triple from a very low base) related capacity-building assistance. This will require a significant shift in resourcing and skills within these international institutions. Scaling public-private financing of sustainable infrastructure: There is widespread agreement on the opportunity for global economic growth and social inclusion presented by increased infrastructure investment. A similar consensus exists on the central importance of infrastructure for the implementation of both the Sustainable Development Goals, for which it represents an estimated 70% to 80% of the total required incremental financing, and the climate change targets set in the Paris Accord of the United Nations’ 21st Conference of Parties (COP 21). But the gap between the current level of infrastructure investment and that which is implied by the SDGs and climate targets is very large – to the order of 100% or an estimated $1-1.5 trillion per year. To close this gap and achieve the goals of higher growth, faster and more inclusive development, and a peak and then accelerating decline of global GHG emissions, the traditional source of most infrastructure financing – public spending – will need to be supplemented. Governmental budgets and international financial institutions’ (IFI) capital are limited and unlikely to see much enhancement in the foreseeable future. The only plausible solution is a big boost in co-financing from the private sector, and this is where international economic cooperation can play a critical role. A mere 1.6% of the approximately $106 trillion in funds managed by private institutional investors worldwide is invested in infrastructure. 58 Yet a recent investment community survey found that over 65% of respondents wished to increase their allocations to infrastructure, with a third indicating a desire to do so in developing countries. 59 The primary obstacles are a perception that the risks of infrastructure investment often do not correspond to the returns (including with respect to recent regulatory capital requirements for certain financial institutions) and a lack of well-prepared investment project proposals. Multilateral development banks (MDBs) and bilateral development finance institutions can be instrumental in solving both of these problems, but will have to make a major shift in their strategies, capital allocation, and staff skill-sets as advocated over the years by several expert reports. 60 Most of their leadership recognize the need for a strategic shift in their role from direct lending (usually to sovereigns) to catalyzing much larger multiples of domestic and international private investment through the expanded use of co-investment, risk mitigation, aggregation, and project development technical assistance. However, their boards and staff are not yet fully supportive of or equipped for this shift. As a result, the pace of change remains incremental, and the international community risks missing a critical opportunity to boost growth, enhance social inclusion, and accelerate progress toward the SDGs and climate change targets. Governments and the business community must mobilize to seize this opportunity and increase public-private financing of sustainable infrastructure in the next few years. They should do so by engaging in collective work at both the C-suite and working levels to surmount impediments that have been identified in terms of risk-return, project development pipeline, aggregation, and regulatory capital. Leaders from governments, DFIs, and other institutional investors, banks, and infrastructure- related firms should join a process along these lines aimed at scaling public-private financing of sustainable infrastructure, including to support well-prepared projects that implement the climate change-related Nationally Determined Contributions of developing countries. This process could link and build upon several recent initiatives to support specific, complementary elements of this agenda, including the Sustainable Investment Partnership 61 Convergence, 62 Global Infrastructure Hub, 63 Global Infrastructure Facility, 64 and Africa50 Infrastructure Fund. 65 The public-private infrastructure investors’ summit that takes place at the Annual Meeting of the World Economic Forum as part of its Long-term Investing, Infrastructure and Development System Initiative could provide a platform for Ministers, MDB presidents, and CEOs to oversee and energize this process, including by setting specific goals for the system as a whole. Refocusing trade and investment cooperation: International trade and investment have been frequently blamed for rising inequality in recent years. However, they have the potential to contribute much more to global growth and social inclusion, provided the right approaches are taken. See Box 9 below with a perspective from the World Trade Organization. A more inclusive approach to international trade and investment cooperation will require a shift in policymakers’ emphasis from the negotiation of formal new norms such as free trade agreements to the facilitation of trade and investment activity within as well as among countries. Such an approach will necessitate convergence of effort around best practices and standards to reduce frictions and enhance social impact, on the one hand, and substantially increase capacity-building assistance for this purpose, on the other. Create comprehensive, online, single points of enquiry for cross-border service providers to learn about the regulatory, licensing, and other administrative requirements in the host country. Establish higher, standardized de minimis customs levels to facilitate cross-border flows of small packages supplied by Internet-enabled retail services providers, especially small and medium enterprises (SMEs), for example by adopting a $100 (or even $200) minimum common threshold for developing countries and a higher threshold, such as $800, for advanced countries. Adopt interoperable, digitally-enabled single windows for customs and border compliance with open application program interfaces (APIs) that allow developers to create digital platforms which seamlessly link SMEs with various countries’ single windows. Establish clear rules pertaining to electronic transmission of data and related services by aligning rules with eading practices regarding intermediary liability, privacy, intellectual property, consumer protection, electronic signature, and dispute settlement; and by allowing the free flow of data across borders subject to an exceptions provision based on Article XIV of the General Agreement on Trade in Services (GATS) concerning the right of countries to protect the privacy of personal data as long as such right is not used to circumvent the provisions of the agreement. Initiate negotiations to establish a plurilateral digital trade agreement among a forward-looking group of countries from various regions, incorporating a comprehensive set of policies and multistakeholder practices such as those outlined above in order to maximize the growth and employment potential of Internet-enabled trade. If such a group included, among other countries, the United States, China, and the European Union, its provisions could be extended on a most-favored-nation basis to all countries as a “critical mass” agreement under WTO rules, thereby serving as a powerful stimulus to global growth and employment, particularly in the SME sector. Develop a comprehensive WTO Framework for Trade Facilitation in Services, with both capacity-building and graduated normative elements as in the recent WTO Trade Facilitation Agreement to support the inclusion of developing countries. Establish a Global Value Chain Partnership, a public-private platform to improve the cross-country inclusivity and social responsibility of global supply chains. The platform would facilitate cooperation between governments seeking to integrate their economies with international supply chains and the companies and experts who could be their partners. The action orientation of the partnership would be underpinned by important new analytical efforts to map existing value chains and impediments to their expansion in new geographies. It would also assemble examples of good practice that can inform the strategies of developing countries to maximize the objective of sustainable development from their participation in these production networks. A group of like-minded governments could catalyze the scaling of responsible supply-chain practices by multinational and other companies around the world by forming an open club that establishes a common floor for such standards. They would assist other countries to join them by offering trade preferences and substantial capacity-building assistance. The 2014 German G7 initiative to spread responsible supply-chain practices and the Sweden-led Global Deal to promote social dialogue could be building blocks for such a coordinated international effort to promote best practice, benchmarking, and consistent reporting by multinational companies regarding the contribution of their operations in developing countries on the key dimensions of sustainable development. The recent partnership between the World Bank and the World Economic Forum to create an “Inclusive Development Hub” to facilitate the contribution of responsible value chains to inclusive development could provide a platform to facilitate progress in this respect in cooperation with the International Trade Center’s supply-chain traceability project, the ILO-administered Vision Zero Fund, and other capacity-building programs that aim to strengthen developing countries’ labor ministries. A more integrated effort across these initiatives, combined with an appeal by governments to their multinational enterprises to apply to overseas operations the basic worker rights and pollution-control practices that they apply at home, could transform global supply-chain practices over the next few years. A public-private process to create a Model Investment Agreement, using the G20 Guiding Principles for Global Investment Policymaking and UNCTAD Investment Policy Framework for Sustainable Development as starting points, should seek to build common ground on various facets of investment agreements, including state and investor obligations. Formulated as a best practice open for voluntary adoption, this model framework would be a bottom-up way to spur modernization and harmonization across the more than 3,200 existing international investment agreements. Similarly, a comprehensive, open-information platform, an RTA (regional trade agreement) Exchange, would enhance transparency and understanding about the similarities and differences among the more than 400 existing RTAs, encouraging a dynamic of learning, best-practice adoption, and cooperation to enable the alignment and even multilateralization of subsets of various rules in a way that reduces the de facto discrimination and trade diversion experienced by developing countries that are not members of the world’s major regional free-trade blocs. In 2016, a rise in anti-globalization sentiment put the spotlight on trade agreements. Trade plays a pivotal role in supporting growth and lifting people out of poverty around the world. However, it is clear that more can be done to foster inclusiveness in the trading system and ensure that the benefits of trade are more widely shared. It is useful to look at this at three levels: countries, companies, and people. Countries: In recent decades, developing countries have become increasingly integrated into the global economic and trading system. As a result, they have experienced rapid economic growth, resulting in convergence towards income levels found in developed countries. Between 2000 and 2015, the share of developing economies in world output increased from 42% to 57% (based on purchasing-power parity). Their share in world trade (i.e. merchandise exports) also rose from 33% to 47% during the same period. This integration has been accompanied by a dramatic reduction in the number of poor people in the developing world, which more than halved from 1.7 billion in 1999 to 766 million in 2013. Companies: Small and medium-sized enterprises (SMEs) continue to have more difficulties than larger firms in overcoming trade barriers and costs. Recent evidence suggests that both fixed costs (those that do not change with the size of shipment) and variable costs (those that increase with the size of shipment) impede participation in trade of SMEs more than that of larger firms. Hence any initiative that reduces these costs is bound to allow many more SMEs to engage in trade. Burdensome procedures and customs and trade regulations are major sources of fixed costs for SMEs. By reducing delays in export time, the TFA has the capacity to boost SMEs’ role in exports.9-3 Evidence shows that micro, small, and medium-sized firms are far more likely than large firms to export, and to increase their export shares, when the requirements to clear exports are reduced. The importance of addressing the tariff barriers faced by the poor is also clear from the analysis of the 2001 US-Vietnam Bilateral Trade Agreement. Between 2002 and 2004, the provinces in Vietnam that experienced the largest tariff cuts in the US market also experienced the biggest declines in poverty.9-5 The reallocation of workers from the informal to the formal sector, induced by the agreement, played an important role in this outcome.9-6 Having joined the WTO in 2007, Vietnam has gone on to make great strides in its development, fueled in large part by trade. More recent research on poverty also shows that tariffs and non-tariff barriers are higher for the poor, which limits their chance to access international markets. 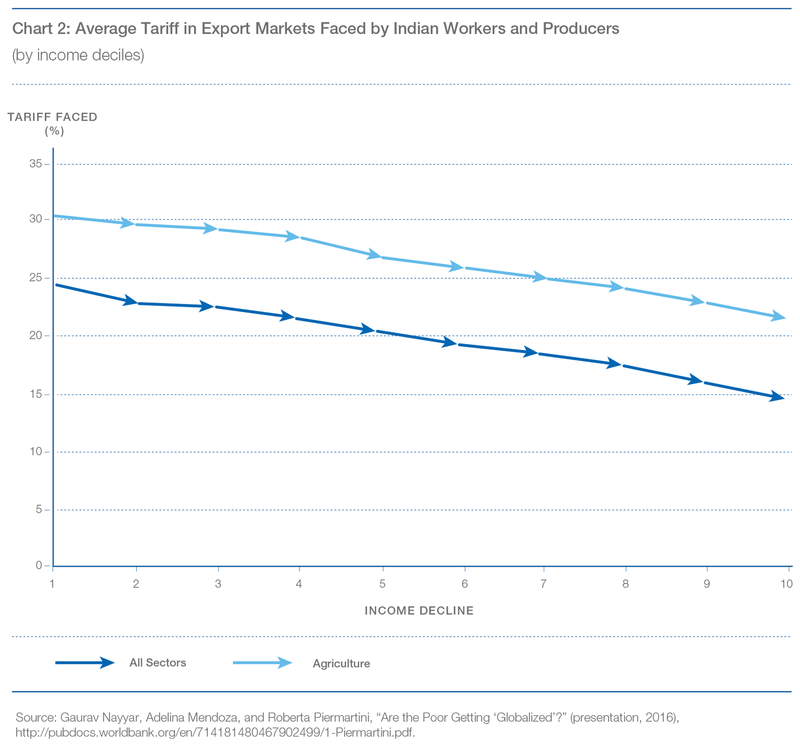 In India, for example, tariffs faced in destination markets are increasingly higher for goods produced by individuals in lower-income groups (see Chart 2). Households in rural areas face an average tariff 10.9 percentage points higher than their urban counterparts. This underlines that the poor are likely to pay the highest penalty if countries stall in their efforts to reduce barriers to trade, or worse, begin to roll back the reforms that have been achieved to date. 55 OECD, “In It Together: Why Less Inequality Benefits All” (May 21, 2015): 29, http://www.oecd.org/social/in-it-together-why-less-inequality-benefits-all-9789264235120-en.htm. 7-1 Government of Canada, “A Plan for Middle Class Progress – Fall Economic Statement 2016” (2016); Growing the Middle Class – Budget 2016” (2016), http://www.budget.gc.ca/2016/docs/plan/toc-tdm-en.html; Advisory Council on Economic Growth, “The Path to Prosperity – Resetting Canada’s Growth Trajectory” (October 20, 2016). 7-2 “Canada’s Example to the World: Liberty Moves North,” The Economist (October 29, 2016); Christine Lagarde, “Statement at Conclusion of Visit to Canada” (September 14, 2016), http://www.imf.org/en/news/articles/2016/09/14/pr16405-statement-by-imf-managing-director-christine-largarde-at-the-conclusion. 8-1 J.D. Ostry, A. Prati, and A. Spilimbergo, “Structural Reforms and Economic Performance in Advanced and Developing Countries,” IMF Occasional Paper No. 268 (2009). 8-2 Atish Ghosh, J.D. Ostry, and M. Qureshi, “When Do Capital Inflow Surges End in Tears?” American Economic Review 106, No. 5 (2016). 8-3 J.D. Ostry, P. Loungani, and D. Furceri, “Neoliberalism: Oversold?” Finance and Development 53, No. 2 (2016). 8-4 J.D. Ostry, A. Berg, and C. Tsangarides, “Redistribution, Inequality and Growth,” IMF Staff Discussion Note 14/02 (2014). 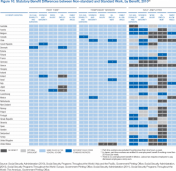 57 International Monetary Fund, “Legacies, Clouds, Uncertainties,” World Economic Outlook (Washington D.C.: International Monetary Fund, 2014), http://www.imf.org/external/pubs/ft/weo/2014/02/pdf/text.pdf. McKinsey & Company Capital Projects and Infrastructure Insights (August 2016), http://www.mckinsey.com/industries/capital-projects-and-infrastructure/our-insights/sending-the-right-infrastructure-message. 59 Frédéric Blanc-Brude, Grace Chen, and Tim Whittaker, “Towards Better Infrastructure Investment Products? A Survey of Investors’ Perceptions and Expectations from Investing in Infrastructure” (EDHEC Infrastructure Institute-Singapore and Global Infrastructure Hub, July 2016): 27, http://globalinfrastructurehub.org/content/uploads/2015/10/GI-Hub-EDHECinfra-Investor-Survey-full-report.pdf. 60 “Blended Finance Vol. 1: A Primer for Development Finance and Philanthropic Funders – An Overview of the Strategic Use of Development Finance and Philanthropic Funds to Mobilize Private Capital for Development” (OECD and World Economic Forum, September 2015), http://www3.weforum.org/docs/WEF_Blended_Finance_A_Primer_Development_Finance_Philanthropic_Funders_report_2015.pdf; “Blended Finance Toolkit” (World Economic Forum), https://www.weforum.org/reports/blended-finance-toolkit; “Building on the Monterrey Consensus: The Untapped Potential of Development Finance Institutions to Catalyze Private Investment” (World Economic Forum, 2006), http://siteresources.worldbank.org/INTINFNETWORK/Resources/CatalysingPrivInvestment.pdf; “The Sustainable Infrastructure Imperative” (The New Climate Economy Initiative, 2016), http://newclimateeconomy.report/2016/; “Report to G20 Deputy Finance Ministers and Central Bank Governors on MDB Internal Incentives for Crowding-in Private Investment in Infrastructure” (Global Infrastructure Hub, 2016), http://www.globalinfrastructurehub.org/content/uploads/2015/10/4a-Knowlege-Sharing1.pdf. 66 “Strengthening the Global Trade and Investment System in the 21st Century Synthesis Report”(ITC and World Economic Forum, January 2016), http://e15initiative.org/publications/executive-summary-synthesis-report-full-report/. 9-1 World Trade Organization, “World Trade Report 2015: Speeding up Trade: Benefits and Challenges of Implementing the WTO Trade Facilitation Agreement” (2015), https://www.wto.org/english/res_e/booksp_e/world_trade_report15_e.pdf. 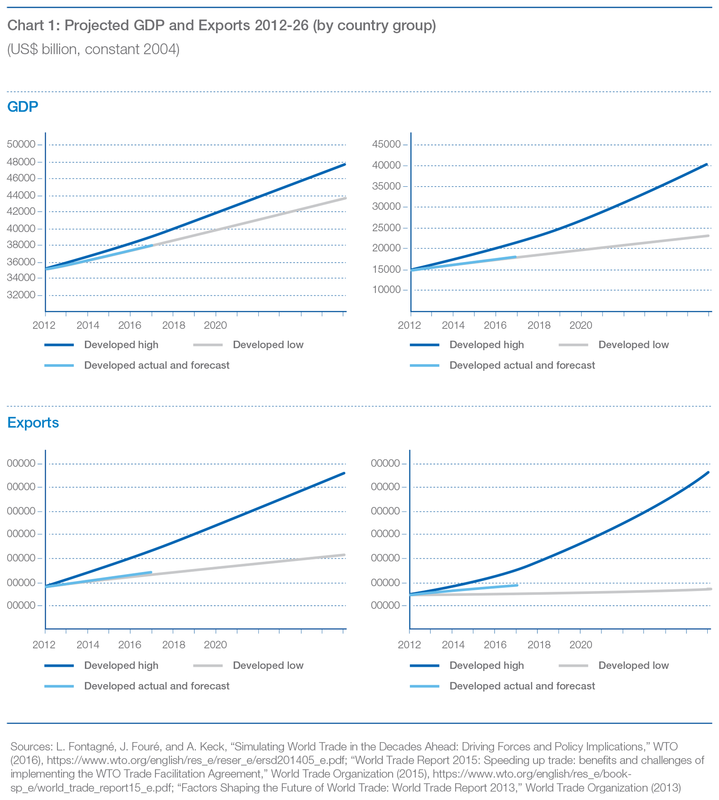 9-2 L. Fontagné, J. Fouré, and A. Keck, “Simulating World Trade in the Decades Ahead: Driving Forces and Policy Implications” (World Trade Organization, 2016), https://www.wto.org/english/res_e/reser_e/ersd201405_e.pdf. 9-3 “World Trade Report 2016: Levelling the Playing Field for SMEs” (World Trade Organization, 2016), https://www.wto.org/english/res_e/booksp_e/world_trade_report16_e.pdf. 9-4 Pablo D. Fajgelbaum and Amit K. Khandelwal, “Measuring the Unequal Gains from Trade,” Quarterly Journal of Economics 131, No. 3, (2016): 1113-80. 9-5 Brian McCaig, “Exporting Out of Poverty: Provincial Poverty in Vietnam and U.S. Market Access,” Journal of International Economics 85, No. 1 (Elsevier, 2011): 102-113. 9-6 Brian McCaig and N. Pavcnik, “Export Markets and Labour Reallocation in Low-Income Countries,” NBER Working Paper No. 20455 (2014).